How much is Danica Patrick Worth? Danica Patrick Net Worth: Danica Patrick is an American auto racing driver, model and spokesperson who has a net worth of $60 million dollars. Danica Patrick was born March 25, 1982 in Beloit, Wisconsin. She is considered the most successful woman in the history of American open-wheel racing. Her win at the 2008 Indy Japan 300 bis the only women's victory in an IndyCar Series race. Hr third place win in the 2009 Indianapolis 500 the highest finish ever (there) by a woman. Patrick competed in the series between 2005 and 2011. In 2012, she competed in the NASCAR Nationwide Series and occasionally in the NASCAR Sprint Cup Series. In the 2013 season, Patrick drove the #10 GoDaddy.com Chevrolet SS for Stewart-Haas Racing in the Sprint Cup Series and a limited Nationwide Series schedule for Turner Motorsports. In 2013, she became the first female NASCAR driver to win a NASCAR Sprint Cup Series pole, turning in the fastest qualifying lap since 1990 in qualifying for the Daytona 500. In her early years, Patrick dropped out of high school to pursue a career in racing in England. She started in kart racing and later raced in Formula Ford in the U.K. before returning to the U.S. and moving up to IndyCars. She signed with Rahal-Letterman Racing (co-owned by former driver Bobby Rahal and talk show host David Letterman) in 2002 and went on to be named Rookie of the Year for both the 2005 Indianapolis 500 and the 2005 IndyCar Series season. She holds the IRL record for most consecutive races running at the finish: as of October 2, 2011, she had completed 50 consecutive in the running. During her time in IndyCar, Patrick also drove for Andretti Autosport (2007-2011). Outside of racing in competitions, she made her acting debut in a 2010 episode of CSI: NY where she played a racing driver suspected of murder. Patrick also voiced herself in The Simpsons episode "How Munched Is That Birdie in the Window?". In late 2013, Patrick appeared on the Food Network's competitive cooking show Chopped and defeated three other celebrities to win. 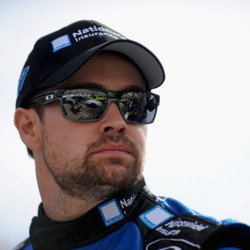 Formerly married to her physical therapist, Paul Edward Hospenthal, they were divorced seven years later and Patrick has been since romantically linked to fellow Sprint Cup Rookie of the Year candidate Ricky Stenhouse, Jr and NFL quarterback Aaron Rodgers.